In bygone days blacksmiths fashioned wrought iron hangers like these in open forges with sledgehammers. 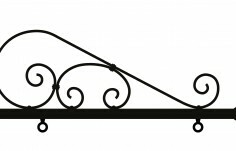 Skillfully forged wrought iron scroll hangers can be true works of art but unfortunately authentic wrought iron is heavy to install, expensive to ship, and will rust easily when employed to hold signage out in the weather. Brown iron rust can drip down and stain your hanger and your handcrafted sign. Danthonia scroll makers use modern tools, weatherproof materials and contemporary metal working techniques - but our pride in fine craftsmanship is unchanged. 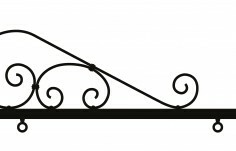 Your handcrafted scroll hangers are made with the same care and attention that we give to each of our handcrafted signs. 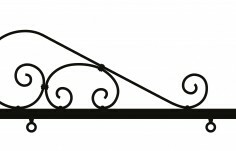 Danthonia 'wrought iron style' scroll hangers are fashioned from sturdy rust-free, powder-coated, marine-grade aluminum. 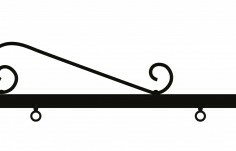 The scroll component is functional as well as decorative - it is engineered to brace the hanger to remain square and rigid while holding the weight of the sign securely in blustery wind and weather. 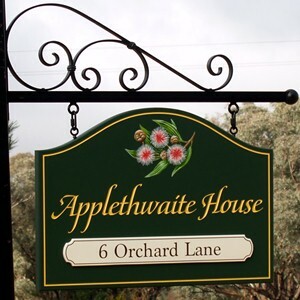 Size 1 maximum sign width = 18"
Size 2 maximum sign width = 21"
Size 3 maximum sign width = 27"
Size 4 maximum sign width = 30"
Size 5 maximum sign width = 32"
INSTALLATION: Please have a local professional securely bolt the scroll hanger to your wall or sign post using hardware that is suitable for your local codes and wind conditions. 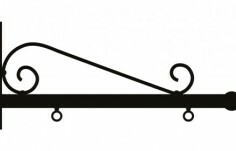 Your sign attaches to the scroll hanger eye bolts with quick links provided by Danthonia. Tighten the quick links with a wrench so passers-by cannot remove your sign. If you are especially concerned you can add a drop of super glue to the threads before tightening.